The tech culture has gained an unfortunate fame of being biased and unwelcoming to women, and with good reason: only 11% of executive positions in tech companies are filled with women, and just 25% of jobs in general are held by female workers. However, this reality in begin to swift in the right direction, mainly due to the wonderful work women in tech have done, proving their capabilities to transform the industry. She is not only a billionaire and top executive of one of the most famous brands in the world, but also, a powerful voice of female empowerment. She created Lean In, a ONG that supports women in the workplace, motivating shared responsibilities at home to allow women have productive work lives outside of their household. She is the responsible of Google’s acquisition of YouTube. In 2006, Wojcicki urged her bosses to purchase the video site, and now it has more than 1 billion unique visitors a month and is valued at an estimated 70 billion dollars. She is known as a former Hasbro and Walt Disney executive; but mainly for aiding EBay grow from 5.7 million dollars in revenues to 8 billion dollars in just 10 years. Last year, despite being a republican, she supported Hillary Clinton’s campaign for president claiming that Donald Trump is a modern Adolf Hitler. Other great females in the industry are Virginia Rometty (IBM CEO), Angela Ahrendts (Apple VP), Safra Catz (Oracle CEO), Ruth Porat (Alphabet CFO), Ursula Burns (Xerox CEO) and Marissa Mayer (Yahoo CEO). 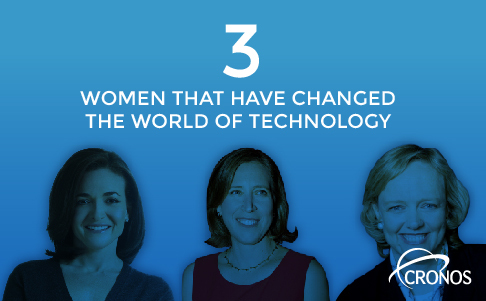 These women have made incredible contributions to their companies, proving that the tech culture does not answer to gender stereotypes.